Larry has been involved with music since his early days in Kansas City, Missouri. 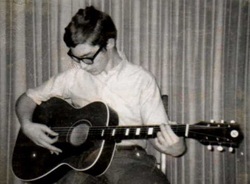 He began to create his own musical path as a member of the junior choir at Congregation B’nai Jehudah in Kansas City, and learned his first guitar chords for Jewish music at Reform Judaism’s Kutz Camp in Warwick, New York in 1970. 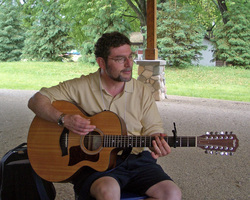 Larry began to take on new roles in adding music to worship and youth group events. 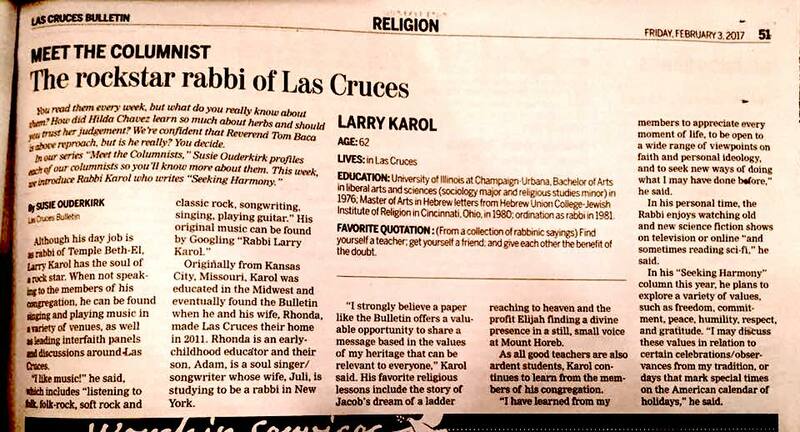 At the University of Illinois, Larry joined the newly-formed Hillel Choir and became its guitar accompanist and co-director. He shared his ever-growing repertoire of popular music at Saturday night Hillel coffeehouse events. 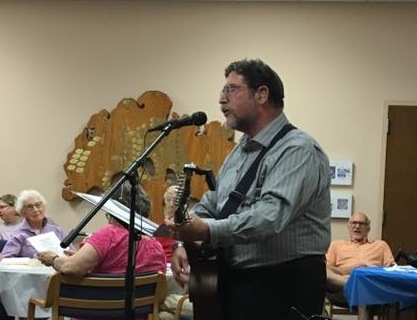 During his years in rabbinic school at Hebrew Union College-Jewish Institute of Religion, Larry continued to share his musical talents in congregations her served as a student rabbi. 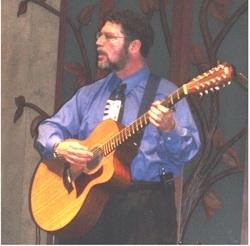 He regularly performed at “Noah’s Place” coffeehouse at the University of Cincinnati Hillel and participated in several Cincinnati Jewish Folk Festivals as an organizer and performer. 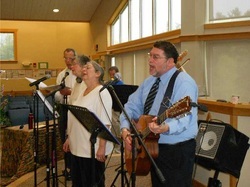 After his ordination in 1981, Larry took the position of assistant rabbi at Temple Israel in Dayton, Ohio, where he was already adding music to worship three weeks after his arrival. Dayton Jewish Center Summer Day Camp director Rhonda Marks invited Larry to share music one day in July of 1981. That was the beginning of “something new,” which led to their marriage in August of 1982. 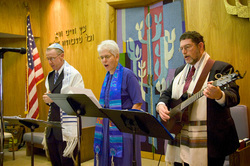 In July, 1984, Larry and Rhonda moved to Topeka, Kansas, where Larry became rabbi at Temple Beth Sholom. 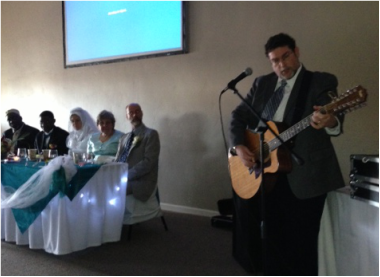 He served as a soloist and a religious school music teacher in addition to regular duties as rabbi and educational director for 22 years. Their son, Adam, was born in 1986. Adam graduated from Berklee College of Music in Boston in 2008, where he majored in professional music. 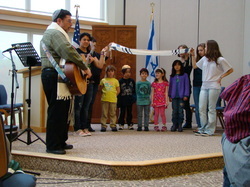 Larry became the rabbi of Temple Israel in Dover, New Hampshire, in August of 2006, and began serving as rabbi of Temple Beth-El in Las Cruces, New Mexico as of July 1, 2011, where is adding music within the congregation and throughout the general community. 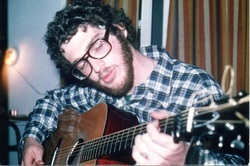 In 1999, Larry attended his first “Hava Nashira” (come, let us sing) songleaders’ workshop at Olin-Sang-Ruby Union Institute Camp in Oconomowoc, Wisconsin. A workshop on songwriting led by Jewish performers and composers Danny Maseng and Craig Taubman inspired Larry to begin his first songwriting time in the genre of Jewish music. He composed the opening tracks of both of his CDs in the fall of 1999: “Two are Better Than One,” which begins his first CD which was produced by Rick Recht (a well-known Jewish singer/peformer/composer) and Darrell McClanahan in St. Louis in 2003; and “Let Me Sing My Way Into Your Night,” the song (which had its beginnings in October of 1977) that begins his second CD, “A New Beginning,” produced by Scott Leader (now of the group “Sababa”) and released in 2005. His songbook, "One Light Above: The Larry Karol Songbook" was released in October of 2007. His third album, "The Road Ahead," was released in December 2014. Larry continues to compose new music– several of the new songs are available at https://soundcloud.com/larry-karol-music and more are posted on www.reverbnation.com/larrykarol and on the "lpkarol" channel on youtube. 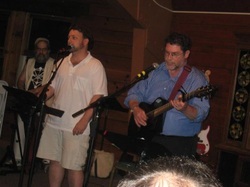 When interviewed by the Dover Community News in December of 2006, Larry reflected on how music is part of his rabbinate and his life: "My music is about hope, faith, community and creating understanding between various religious groups; it's what I've done in my rabbinical work. I try to use the music as a way of expressing biblical passages; I take the traditional texts and link them to various aspects of our lives. Song allows us to express emotion through the interplay of word and the music; even the chords and harmony. It's a much richer way to create a feeling of illustrating a lesson."